– Check out new team-mates John and Guy talking business here. Honda Motor Europe is delighted to announce an exciting two-rider line-up for its 2017 Road Racing assault at the North West 200 and Isle of Man TT in the Superbike classes. 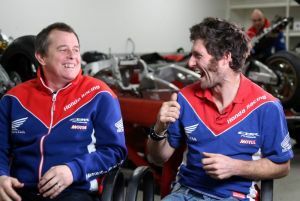 Re-signing for the Honda Racing team is TT legend John McGuinness, who will be joined by Guy Martin on the all-new Honda CBR1000RR Fireblade SP2. Making his return to racing after a year away, fan favourite Martin will form a formidable team with McGuinness and the brand new Fireblade SP2 on the roads. Martin has enjoyed huge success on the roads during his career securing wins at various races including the Ulster GP, Scarborough Gold Cup, Armoy, Cookstown and also the Southern 100. He has also stepped on the TT podium 15 times and will be chasing his elusive maiden TT win with the Honda Racing team. Meanwhile, McGuinness will be looking to add to his impressive tally of 23 TT wins, and riding the new Fireblade SP2, will also be aiming to recapture his lap record which was broken during last year’s race. The Honda CBR1000RR Fireblade is the most successful 1000cc machine ever at the Isle of Man TT and Honda aims to add to its remarkable record with the new SP2 version, which is the ultimate expression of the Fireblade’s Next Stage Total Control concept. The SP2 is a road legal homologation special based on the Fireblade SP that is specifically developed for racing and features a revised cylinder head with larger valve sizes and lightweight Marchesini wheels for even greater performance. The all-new Honda CBR1000RR Fireblade SP2 will make its road racing debut at the North West 200 in May. For all the latest news and information on the Honda Racing team follow @HondaRacingCBR on Twitter.